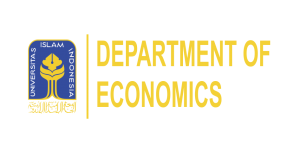 The Department of Economics was established in 1991 and has been accredited “A” from the Board of National Accreditation (BAN-PT). The curriculum in the Department of Economics is designed to produce Islamic and progressive economists that has knowledge in theories, analytical tools and its application. The focus interests offered are especially Islamic finance, Islamic banking, international business, and regional economics and public policy. The students are also equipped with soft skills and leadership skills as part of developing their character strength. The graduates have widely opportunity to pursue careers as an economic and financial analyst, researcher, academician, or entrepreneur. Current graduates have worked in various fields such as in the public institutions, financial and banking sector, private sector and others.